Always in the mood for a carnival? Put on your mask and head to Tito’s in Goa every Sunday for the full carnival experience: dancers, a live band, King Momo and all! Tito’s Carnival is a great way to spend a Sunday night in Goa. Mark, who plays host or King Momo’s Court Jester for the night, kicks off the show with a mix of traditional dances like the Portuguese Corridinho or the Goan Deknni that one rarely gets to see these days. 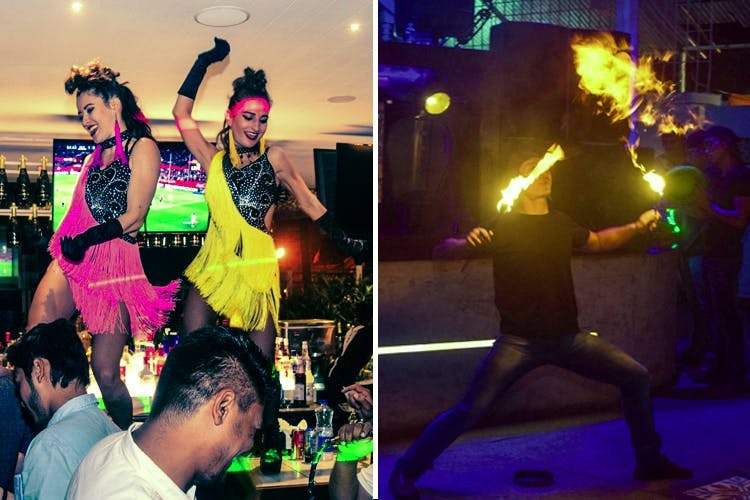 There is also fire juggling and fire limbo acts, and the local award winning dance troupe called Dance-O-Philia performs a marvelous fusion performance of acrobatics and Latin moves. They have the live band Smooth playing through the night, and a Bachata dance workshop to get in to the groove. The finale involves King Momo coming in with his entourage of carnival mask-clad dancers and adding a whole new layer to the festivities. And you are not allowed to just sit and watch the show when King Momo is in the house, as they will entice each one of you to join them on the dance floor. The band and the DJ keep the revelries going on till the wee hours of the morning with a mix of Goan, Portuguese, Latin and Retro tunes. The show starts at 8.00pm and finishes by around 12.30am, after which the party continues on at Mambo’s, so head there early to catch the full show.